The Army is evaluating three types of light attack helicopters as it tries to fill one of the final gaps of its combat modernization. The models under consideration are the Eurocopter EC 635, the Bell 407 AH and the Boeing AH-6i, according to Defense Market Intelligence. The AH-6i begins trials this month in Chile. The Army has extensive experience operating a forerunner of the AH-6i, the MD 530, which the Army is seeking to replace as its standard scout helicopter. Eurocopter should be considered a strong contender, too, given its prior sales to the Army and Navy. All three models under review would have greater weapons capabilities than the MD 530 plus electronics and optical equipment. The Army has upgraded its armor, artillery, infantry, logistics and engineer units, leaving air defense and attack helicopters as the final pieces of its modernization strategy. Meanwhile, the Air Force is getting more serious about acquiring a batch of advanced trainers. FACh is expected to issue a request for information from various manufacturers by year end, according to Jane's Defence Weekly. A formal request for proposals would follow in 2013, with a selection later that year and deliveries starting in 2016. FACh is seeking to replace its fleet of A/T-36 planes, which have become costly to operate. An analysis in the blog Noticias FFAA Chile says the planes under possible consideration include the M-346 from Alenia Aermacchi, the T-50 from Korea Aerospace Industries, the AI-63 Pampa II built in Argentina, the Yakovlev YAK-130, the Hawk LIFT from BAE Systems and L-15 from China's Hongdu Aviation Industry. Alenia Aermacchi might have an edge in the competition because the company and FACh's Enaer agreed in 2008 to jointly market the M-346 and the M-311 in Latin America. A small group of FACH warplanes, pilots and support personnel spent a week training at Lackland Air Force Base in Texas. Three F-16 Block 50 fighter jets flew for exercises with a unit of the Texas Air National Guard. The F-16s flew nonstop from their base in Iquique, refueling in midair with a KC-135 tanker. This is not the first time FACH pilots train with the U.S. Air Force. The two air forces have a long relationship and they share some doctrine and tactics. In fact, Texas-based military personnel visited FACH facilities in June. Mutlinational exercises are valuable because they expose pilots to fresh challenges. It's sort of like scrimmaging with another football team, rather than your own squad. Chile hosts an annual fighter exercise, called Salitre, with several air forces. Crews from Argentina, Brazil, the U.S., France, Uruguay, Canada and Colombia are expected at this year's meet, scheduled for November at the Cerro Moreno air base near Antofagasta. Chile is considering adding troops to the European Union's peacekeeping forces. Minister of Defense Andres Allemand and his German counterpart, Christian Schmidt, discussed in Berlin the potential use of Chilean soldiers in multinational operations. Chile would be the first Latin American force to join the EU. Schmidt expressed interest in the experience of Chilean troops, which are serving in the United Nations' Haiti stabilization program. A brigade of about 600 troops has been working in that Caribbean nation for several years. In May, the Chilean Senate authorized to extend the commitment (its largest-ever peacekeeping deployment) for another 12 months. With little threat of war on the horizon, Chile's armed forces have been honing their peacekeeper role. A joint force has been created with Argentina. The acquisition of a multi-role ship last year gave Chile the ability to mobilize an infantry battalion, support vehicles and medical staff over great distances. Its airlift capability is still modest, but the recent acquisition of three KC-135 cargo/tanker planes from U.S. stockpiles gave the military some valuable tonnage. Chile's military these days is equipped pretty much like a NATO member, so integrating its troops with the EU would not be difficult. In another humanitarian effort, Chile has agreed to participate in a regional disaster relief force. When the Navy acquired an amphibious assault ship last year, it said the vessel would be used for humanitarian as well as military purposes. The Navy is living up to that pledge, deploying the Sargento Aldea on the largest medical relief mission in Chile. More than 75 medical professionals are among a force of 600. An estimated 6,000 people are being treated, which will trim hospital waiting lists in the Aysen region by 30%. Those numbers help illustrate the health crisis in Chile and its shorthanded public hospitals. They also show how the armed forces are much a part of the nation's health care system. The Navy has been a longtime provider of medical care in isolated areas, and the Army's field hospital and medical staff often have been used to help sick civilians, especially the poor. The military has the resources to help out, and such goodwill missions help polish an image of the armed forces that's already fairly positive. The Sargento Aldea has 51 hospital beds, two operating rooms, a dental clinic, an x-ray room and other facilities. Six air forces that use the RecceLite reconnaissance pod met in Holland recently, and among those in attendance was the Chilean Air Force. The news is fresh evidence that Chile has acquired the pods, which are made by Israel's Rafael Advance Defense Systems. RecceLite provides real-time reconnaissance and data links. The word around aviation circles is that Chile has bought advanced Rafael pods for the FACH's F-16 fleet. Earlier, photographs of Chilean F-16s showed a targeting pod that appeared to be the Litening. The Litening and RecceLite resemble each other, and it's possible FACH is using both types. FACH has never publicly acknowledged having targeting or reconnaissance pods. Because they are not weapons, per se, they are not disclosed in the UN arms exports reports. President Sebastian Piñera's 2013 budget seeks 2,000 more police officers and 200 additional investigations officers in hopes of reducing Chile's crime problem. The Carabineros police force today counts with 44,500 men and women, and they are a busy bunch: According to Carabineros' 2011 annual report, more than half a million persons were arrested that year in Chile (population 17 million). The budget also expands forensic capabilities and crime-prevention programs. The budget, which totals more than $60 billion, also devotes funds specifically for Plan Frontera Norte, an effort to control drug trafficking and illegal immigration along the Peru and Bolivia borders. Indeed, the drug trade and related crime is one of Chile's main security problems.The budget has been sent to Congress, which must pass a final bill by the end of November. Update: The budget for the Ministry of Defense will be $2.77 billion in 2013. That represents an increase of 2% over the 2012 outlay. Is the End Nigh for Chile's Aerospace Company? The Air Force is considering shutting down its aerospace business, which is heavily in debt and unable to forge international partnerships. FACh commander Gen. Jorge Rojas has ordered a study into shutting down Empresa Nacional de Aeronautica, or Enaer, the online newspaper El Periodista reported. The move came after a planned alliance with EADS/Airbus Military became frustrated in legal entanglements. If Enaer is closed, about 800 workers would be affected, although one-third of them would staff up a new Air Force wing that would take over aviation maintenance duties. No doubt, the demise of Enaer would be a blow to Chile's aerospace aspirations. The company, which is about $60 million in debt today, was responsible for one of Chile's most successful military exports, the Pillan T-35 basic trainer. Its plants have refurbished C-130 Hercules for various air forces. The end of Enaer raises other serious questions. For example, the company was supposed to have a role in the development and construction of Embraer's C-390 transport, as part of Chile's plan to acquire several of the planes. Would Chile be forced out of the program? And how does the failed EADS deal affect the Navy's and Army's own plans for foreign alliances? A small number of Panhard PVP light armored vehicles includes the PL80 protected weapon station, which can be equipped with a machine gun or 40mm automatic grenade launcher. Other weapons options are the Nexter Munitions GALIX grenade dischargers and an acoustic device that sends a painful sound blast. Read the entire note about the PVPs, with extensive details, at Defesa Global. In fact, look for more postings from that informative blog on this space. Thanks to a reader who sent data from SIPRI on Chile's defense acquisitions, here's a list of some systems that have been added in recent years but had not been reported in this blog. M-108 VBLC artillery command vehicle. The M-108 flopped as a 105mm self-propelled gun, but the Belgians converted them to mobile command systems. Chile bought 21 of them, which were delivered in 2009. Panhard PVP armored vehicles. These light 4x4 vehicles were delivered in 2010-11 for Marines working with the peacekeeping force in Haiti. Cost for the 15 vehicles was 2 million euros. Only nine have been delivered. M-113A2 in ambulance configuration. Germany sold 24 of these to Chile in 2009. SM-39 Exocet missiles. The Navy bought a dozen of these anti-ship missiles, which are fired from submarines. AIM-7M Sparrow anti-aircraft missiles. Bought 75 from the Dutch as part of the deal for four used frigates. Delivered in 2006-08. Black Shark torpedoes. One of only a few acquisitions made in Italy, 100 of these advanced torpedoes were bought in 2005-10. Chile's armed forces appear to take a much larger role in internal security affairs under a strategic framework developed by President Sebastian Piñera's administration. The National Strategy for Security and Defense for the first time specifically puts security problems such as drug trafficking, organized crime and piracy under the broad umbrella of national defense. These unconventional threats have fundamentally changed how Chile views its security needs, the president says. Some exist on an international scale, which is of particular importance to Chile as it positions itself as global trade partner. Some politicians have criticized the plan, saying it expands the military's power into areas that aren't part of its mandate, and the policy could violate the constitution. Since the end of military rule in Chile, the Carabineros and Policia de Investigaciones have been tasked with safeguarding internal security. The National Strategy, which now goes to a legislative review, is characterized as a companion piece to the new military budget law, which is on its way to final approval. Indeed, some military acquisitions such as UAVs and maritime patrol aircraft have been made with an eye toward patrolling border areas and the vast territorial waters. The Navy, of course, has long been responsible for security of the littoral area and the exclusive economic zone. With Chile's government struggling with a health crisis, the Army has been sent out to provide emergency medical care to the civilian population. Mobile hospital units are operating at two hospitals in the metropolitan region, providing emergency-room treatment and hospitalization for the most ill patients. It's flu season on Chile, and a nasty virus is going around. It's estimated that cases of respiratory illness are up 70% compared with last year. So, President Sebastian Piñera ordered the Army out of the barracks and into the emergency wards. It's not the first time the Army Modular Campaign Hospital has rendered aid to civilians. In fact, it's been deployed 29 times since 2001, performing hundreds of surgeries. Its long list of missions underscores how the armed forces are an integral part of the social safety net, much like they are also the muscle of Chile's disaster response system. Update: The Army's role as administrator of social programs doesn't stop with health care. The Army also has been put in charge of a homeless shelter at a stadium. This came as a cold wave in Santiago left several homeless people dead. With the reform of the military budget all but a done deal, it's time to do some educated guessing on what programs are in line for the first four-year spending plan. Here are my estimations for major programs in the 2014-2018 timeframe, which would coincide with the next presidential term. Airborne early warning. The sole Condor AEW plane is aged and FACH is looking at a turboprop-type platform. This is the type of weapon that can be used for anti-drug operations and has a high likelihood of being approved in time for the retirement of the Condor, perhaps in 2015. Advanced jet trainer. The FACH T-36 Halcon planes are quite outdated. A plane with capabilities beyond the Pillan basic trainer and the Super Tucano is needed to fill a training gap. Transport helicopters. The Army is trying to replace its old Puma helicopters with Cougar or Super Puma 'copters. This acquisition may happen before the next budget is drawn up, and perhaps as early as this year. Attack helicopters. The Army has considered the Boeing AH-6 and similar light helicopters to replace about 15 MD-530 helicopter used in the scout role. Submarines. The two Type 209 subs will need to be replaced in about 5-8 years. A new contract or even a request for bids may not happen in the 2014-2018 budget, but certainly in the next one. Offshore patrol vessel. A slam dunk for the Navy, which has long planned to have at least four OPVs built domestically and is already at work on the third. Air defense system: The Norwegian NASAMS and Avenger systems have already been selected. It's unclear if contracts will be signed before the next budget. Wheeled armored vehicles. The Navy needs to equip its amphibious assault ship with 30-40 APCs. Stryker and LAV 8x8 vehicles have been rumored to be choices. This is another program that may be funded during the current presidential administration. Tactical transport planes. Two or three C-130 Hercules remain in service and they are reaching the end of their useful life. Chile is one of the partners in Embraer's C-390 project and it is expected to purchase five of the planes. Unmanned aerial vehicles. FACH has already purchased three Hermes 900 UAVs and reports have said the Navy and Army could follow with purchases of their own.This is another system whose civilian applications make it more likely to be funded. Also expect tactical-level UAVs to be acquired. Maritime patrol aircraft. The Navy's P-3 Orion fleet needs extensive repairs, and a decision has been made to replace them with C-295 Persuaders. The Navy already has acquired three Persuaders and is expected to exercise an option for five more. One by one, Chile is finding and removing thousands of landmines dating back to the standoffs with its neighbors in the 1970s. But less than one-third of all mines are gone. More than 180,000 antipersonnel and antitank mines were planted in various border areas. So far, some 50,000 have been removed, leaving years of work still ahead. Chile's government this month took an unusual step, hiring a relief organization, Norwegian People's Aid, to cleanse an area that straddles the Peru-Chile border. This is the first mine-clearing job in the country for People's Aid, which has been involved in Chile since 1985. The new program arose after storms caused dozens of mines to wash onto beaches and roads. Also, a Peruvian taxicab drove through a marked minefield, killing the driver, in May. Chilean Army and Navy engineer units have been clearing mines since 2002, as part of Chile's obligations under the Treaty of Ottawa. Some Chileans don't mind the minefields at all, believing they deter drug trafficking and illegal immigration. To their disappointment, the mine-clearing job may be slow but the government is committed to finishing it. From a military standpoint, the minefields no longer have much use because they've been identified and marked. But in the 1970s, the mines helped Chile narrow a big gap with Peru's potent military. The most sweeping revision of Chile's military budget passed unanimously in the lower chamber of congress Wednesday, June 13, clearing an important milestone. The proposal now moves to the Senate. For decades, 10% of export sales by the state-owned copper company, Codelco, have been earmarked for military acquisitions. The new law eliminates that lucrative mechanism, replacing it with a budget process similar to what other government agencies use. That is, lawmakers will get final say (really, a say for the first time) on the defense budget and there will be much greater transparency in acquisitions. The "copper law" yielded upwards of $1 billion a year for Chile's military, and no doubt the new financing system will reduce those sums. Yet, the revision establishes an annual spending floor of 70% of the average sum the copper law provided from 2001 through 2010. That works out to roughly $600 million. In general terms, the new mechanism sets up a broad strategic budget drawn up every 12 years, and more specific outlays approved every four years. A Strategic Contingency Fund will be set up to finance a potential conflict, or to take advantage of a noteworthy bargain in the international arms market. It will be initially funded with the copper law surplus, which is believed to be a few billion dollars. EADS will form a partnership with Enaer, the aviation services and manufacturing company operated by Chile's Air Force. The two firms will form a new company that will manufacture aircraft components and provide maintenance services. The deal increases EADS' footprint in Chile, where the European consortium has had success selling military planes (C-212, C-235, C-295), helicopters (Super Puma and similar models) and a satellite. Enaer's current activities will be folded into the new company, which will provide Enaer with fresh investments and a larger workload. But Enaer employees are not happy with the news. They fear hundreds of workers will be laid off. Enaer has had its ups and downs. It has a steady business servicing Air Force planes and some civilian jets, while boasting Chile's most successful military export: the T-35 Pillan basic trainer. But there have been times when business was light and the company was posting losses. In 2009, management laid off 200 workers. The defense leaderships of Chile and Turkey have signed a cooperation agreement that could bring new business for defense contractors of both nations. Already, military officials have made a flurry of visits, including a Turkish delegation that toured Famae and Asmar facilities. The head of Chile's Navy, Adm. Juan Gonzales Fuentealba, visited the Anadolu Shipyard, where he reportedly expressed keen interest in the company's landing ships. Chile's ambassador to Turkey, Jorge Arancibia, who happens to be a former commander of the Navy, joined in the visit. Chile and Turkey have in common some key weapons systems, including F-16 fighter jets (some Chilean pilots trained in Turkey, in fact), Leopard 1 tanks and Type 209 submarines. Famae, the Army-owned munitions company, has developed a couple of logistical support vehicles. Although you won't find them on Famae's website, videos on YouTube show a bridge layer that uses a Leopard 1 chassis, and an M-548 munitions carrier that has been modified to carry fuel and serve as a mobile gas station. Famae is primarily a manufacturer of munitions, anything from 9mm rounds to 155mm artillery shells, and small arms such as assault rifles and submachineguns. Every once in a while, the company tries its hand at bigger projects. In the 1980s, it built some Piranha armored vehicles under license from Mowag. Chile's Navy recently took delivery of two Eurocopter Super Puma helicopters that were bought used from a private company. The AS332L Super Pumas are equipped for transport, patrol and search & rescue missions. With room for more than a dozen troops, they are large enough to carry a squad for interdiction operations. Up to now, the Navy had only one other similar Cougar helicopter capable of such a passenger load; its Dauphin light helicopters are exclusively for patrol and SAR. Chile's Navy has been a longtime operator of the Super Puma/Cougar helicopter family. It acquired seven in 1990: six for anti-ship and anti-submarine warfare and one for transport. Two of the weaponized helicopters have been lost to accidents, leaving just four still in service plus the three now operating as as transports. The Navy's Proyecto Ícaro envisioned the acquisition of five transport helicopters, but funding for the full program never materialized. With the arrival of a new multi-role ship, interest has increased to add ship-borne helicopters, and the head of the Navy's aviation arm, Rear Adm. Alberto Undurraga, told Soychile.cl that hopes are to secure funding for the three remaining aircraft in the "medium term." A steel company in Chile is planning to build a submarine, which would be the first such project in Chile. The Crocodile Class 250 sub will be used for research and rescues, and would not have military capabilities. Still, Chilean officials laud the effort, even though the Navy has not agreed to acquire the sub. The Crocodile -- being built by a company named Vapor Industrial -- can operated at a depth of 300 meters with a maximum endurance underwater of three hours. Meanwhile, the Navy-owned Asmar shipyard is building a third offshore patrol vessel for the Armada. The new ship will vary slightly from two sister ships already delivered: It will have a hardened hull to operate in Artic waters and better weaponry. The vessels are based on the German Fassmer OPV 80 design. The 1,900-ton ships have a maximum speed of 20 knots, maximum endurance of 30 days and a crew of up to 60. The main armament is a 40 mm gun, plus several .50-caliber machine guns. The first two were delivered in 2008-09. UPDATE: A 76mm gun, reinforced hull and navigation system will increase the cost of the new offshore patrol vessel by 43% over earlier boats. The total cost was not given. The U.S. and Chile have built a training center for peacekeeping mission at a military base in central Chile. The $460,000 installation consists of an urban setting and was specifically built for "blue helmet" operations under the command of the United Nations. Besides U.S. and Chilean troops, soldiers from Brazil, Argentina and other UN member countries will train in Concon, where Chile's marines have one of their four bases. The presence of U.S. troops rattled left-wing politicians, who characterized the project as a U.S. intrusion for belligerent purposes. Thar forced Defense Minister Andres Allamand to try to soothe critics' nerves. Chile's most significant role in UN peacekeeping missions is in Haiti, where it has stationed about 600 troops with support vehicles and helicopters. An Air Force plane that crashed, killing all 21 persons on board, had just left a maintenance facility without some scheduled repairs and little more than a paint job. The C-212 spent five months at an Enaer facility and underwent a major check back at its base. Yet the plane never got a bolt replacement the manufacturer recommended, and a crack in the wing and a faulty emergency beacon were never fixed, according to La Tercera. These details emerged after the Air Force released the maintenance records for the C-212, which crashed Sept. 2 as it tried to land on an island with a team of earthquake reconstruction volunteers. A popular TV personality also died in the crash, further heightening public interest in the tragedy. The plane's mechanical problems don't necessarily explain why the C-212 crashed on approach, although the bad beacon might explain why it took so long to find the wreckage. The plane also was overloaded on its final flight, although it's unclear if that could have been a factor in the failed landing, when much of the fuel already had been spent. But the combination of celebrity and the Air Force's waffling in the investigation has the service in a crisis. Already, one general has resigned. The mess also is undermining the Air Force's image as an elite, cutting-edge institution. Chile's armed forces were unsure they'd get enough volunteers this year after a protracted student protest frustrated the military's recruitment efforts. But in the end, more than 21,000 applied for military service -- 53.5% more than the required number. In the Army, 11,040 were accepted, including 842 women. Indeed, the interest among women to serve continues strong. More than 4,000 applied for the 842 slots available to them in the Army, meaning that just one in five was accepted. The Navy enlisted 620 men, the Air Force 460. This marked the sixth consecutive year that the three branches have filled their conscription rolls without having to call up anybody. There's a sense of patriotism for those who volunteer, but they also enjoy free training in technical and vocational fields. 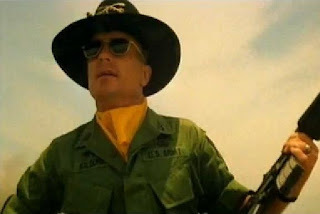 There's the morale aspect, too: Ask any commander, and they'll tell you they rather have a force of volunteer soldiers than anyone who's under compulsion to serve. This month marks the 30th anniversary of the Falklands War, and Chile's role in the war also is being remembered. Kept secret for decades, Chile's assistance to Britain has come to light over the years, and it was extensive. The head of Chile's Air Force at the time, Gen. Fernando Matthei, was the principal figure. Mindful of Argentina's attempt to take three Chilean islands by force in 1978, Matthei was eager to help the British, and the Brits sought him out. Matthei, who had served as military attache in London, authorized a range of intelligence assistance. Radar tracking, electronic eavesdropping and other surveillance Chile conducted during the war gave Britain the eyes and ears it lacked otherwise. It was all monitored in an underground war room in the Punta Arenas area. All of this, of course, was done in utmost secrecy. Gen. Augusto Pinochet ordered Matthei to deal directly with the British officer in Chile, Wing Commander Sidney Edwards. That gave Pinochet and Chile's government some cover in case word leaked out. The Royal Air Force surreptitiously delivered a radar and other surveillance equipment to the south of Chile using RAF Hercules C-130 transport planes that were disguised with Chilean markings. Alas, the cover didn't work perfectly because the Spanish for "air force" was misspelled. When a radar had to be shut down for maintenance, the consequences were tragic: Argentine fighter-bombers were undetected as they attacked two British transports, destroying both. Eventually, the English rewarded Chile for its support, sending a batch of Hawker Hunter fighter planes, Canberra bombers, anti-aircraft missiles and radars. The biannual Fidae air show is in full swing this weekend, with nearly 500 exhibitors and 75 aircraft on display. Here's a roundup of developments in this year's show. The Air Force has taken delivery of the third and final KC-135 air tankers it purchased from U.S. stockpiles in 2009. The Army introduced a lightweight UAV. The Lascar has a two-hour endurance and maximum ceiling of 11,500 feet. It would be used primarily for observation purposes. Boeing is in early talks with the Army for the acquisition of AH-6i attack helicopters. A report says the Army could use the AH-6i to replace 17 MD530 helicopters that Chile has armed with rockets and guns. 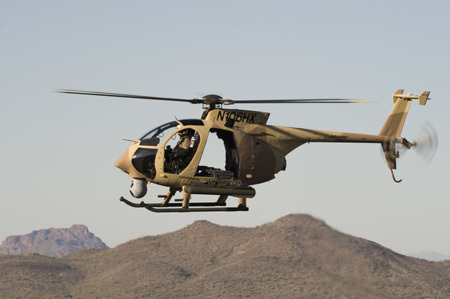 An earlier report noted that Bell is pitching its 407 light helicopter as the Army considers an attack helicopter with anti-tank capabilities. Fighter jet manufacturers are hoping the Air Force will launch a competition for a replacement for Chile's F-5 fighters, which are nearing retirement age. The deal could be for 12-15 planes, but the government has done nothing yet to seek a replacement. Brazil's Embraer announced orders for its Super Tucano turboprop trainer and attack airplane worth $180 million. 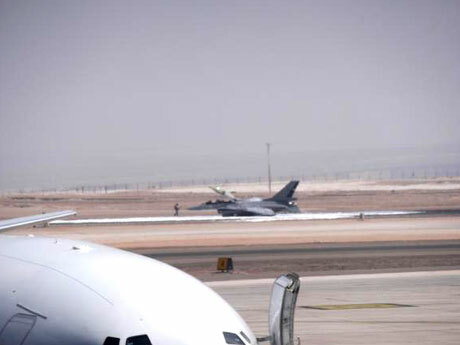 An F-16 fighter from the 5th Air Brigade at the Cerro Moreno Air Base near Antofagasta made an emergency landing after part of its landing gear failed. The jet landed with two its three wheels, sustaining some damage. The plane was in a training mission when the accident occurred around 1 pm on Friday, March 30. The two pilots were unhurt. Judging from the plane's markings and its home base, it was a F-16B MLU. The plane was part of a batch acquired second hand from the Netherlands in 2005. Three Puma SA-330L helicopters just back from a major refurbishment are being put up for sale. The Army has had a change of heart and instead of using the helicopters now wants to standardize its transport copter fleet with AS-532 Cougar helicopters, according to El Mostrador. The Army already has purchased eight Cougars. The $20 million upgrade included new digital communications and control systems, GPS navigation, LCD cockpit displays, night vision gear and defensive countermeasures. El Mostrador blames intermediaries for Eurocopter for a program that ultimately served no purpose and diverted funds from other Army programs. Still, funds fromthe sale of the helicopters could be used on new material, possibly a Super Puma helicopter. F-16 MLU. Notice pod on starboard side of jet intake. Some stunning pictures of Chile's jet fighters and other aircraft are illustrated in the website of aviation photographer C.J. Vanderende. The images are good enough for any military or aviation enthusiast to appreciate. But a couple of shots are particularly interesting because they seem to confirm the existence of the Litening targeting pod in Chile's arsenal. Chile's Air Force is guarded about details of the electronics on its warplanes, but some unofficial sources had mentioned FACH's acquisition of the Litening, The Litening has sophisticated vision gear, including an infrared camera, and a laser designator that works as a targeting pointer. Its technology enables the use of precision munitions and makes night operations much easier. The Litening pod was developed by Israel's Rafael Advanced Defense Systems and Northrop Grumman has joined in the project.